Concrete Restoration is a growing field in the concrete construction industry. Staining, engraving, and overlays are typically used for concrete restoration projects. Often our clients have concrete that is in good condition and doesn’t need to be removed to be improved. If the client decides they wish to restore their existing concrete (as opposed to removing and replacing it), the concrete can potentially be stained, engraved, overlaid, or a combination of the three. Concrete Staining can bring a plain floor to life. Concrete stain is a topical color placed on the concrete which either embeds itself or reacts with the surface to show color. 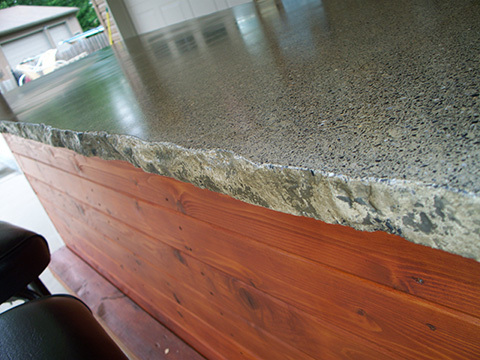 Our concrete stains are UV-stable and perfect for both interior and exterior use. A single concrete stain—or a combination of multiple stains—can be used on a concrete floor, and both new and old concrete can be stained. Concrete Engraving is an excellent choice for anyone with nice-looking concrete that they would like to enhance it with a pattern and color. Concrete engraving and staining often work hand in hand with one another. Concrete engraving is the process of scoring lines up to ¼” deep in an existing concrete pad using a pattern chosen by the client. Once the concrete is engraved, it is stained and sealed, and the dull gray concrete is transformed into a beautiful work of art that compliments its surroundings. There are a variety of patterns to choose from—or we can complete a customized design for our clients. This process can be applied to both new and old concrete, but is predominately used on existing concrete. Engraving is typically used on basement floors, patios, driveways, and sidewalks. See our Photo Gallery more concrete engraving projects. Concrete Overlays are typically used over existing concrete if the client wishes to have a new look without replacement and wants a textured pattern. Concrete overlays are thin, polymer-modified, cement-based toppings applied over existing concrete. Often concrete overlays are stamped in a pattern and texture to give the look of cobblestone, slate, or any stamp pattern we offer. One thing to note about overlays is that the existing concrete must be in decent condition because any imperfections on the existing slab will eventually affect the overlay in the same manner. Ameripolish Color Juice – Water Based Dye: This stain is used for either hard troweled or broom finished concrete slabs, used with both interior and exterior projects. Brickform Reactive Stain – Acid Based Stain: This reactive stain is used for hard troweled concrete floors. See our Photo Gallery more details.